The Apollo 15 Command Module Endeavour, with astronauts aboard, nears a safe touchdown. In this historical photo from the U.S. space agency, the Apollo 15 Command Module "Endeavour", with Astronauts David R. Scott, Alfred M. Worden and James B. Irwin aboard, nears a safe touchdown in the mid-Pacific Ocean to end their lunar landing mission. Although causing no harm to the crewmen, one of the three main parachutes failed to function properly. 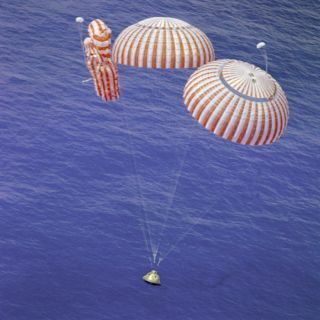 The splashdown occurred at 3:45:53 p.m., August 7, 1971, some 330 miles north of Honolulu, Hawaii.